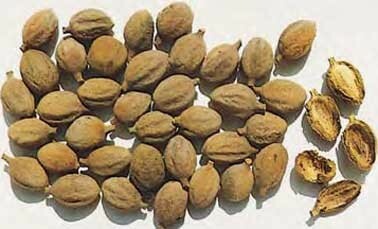 Baheda is a very useful herb, which help you in getting beautiful skin and eyes without any hassle. You can take this herb, if you face any pain or swelling in any part of the body. Baheda is a huge deciduous tree, which is found all over the India.The flowers of this herb blossom in the month of May. It is also grown as an avenue tree. This herb has many substances in it, which includes ellagic acid, galloyal glucose, fatty acid, glucose, linoleic acid, tannin, protein and many others. It is a laxative and rejuvenative substance, which is proven useful for throat, eyes and hair. It helps in flatulence, loss of appetite, piles, thirst and worms. It is used to reduce pain and burning sensation, give black color to hair and boost hair growth. It is effective at treating many eye ailments, like corneal opacity, myopia, chronic and acute infective conditions, and immature cataract. It works on many skin diseases. It is used to reduce blood pressure and cholesterol. It acts as anti-diarrheal and astringent. It is also useful to prevent aging, increase immunity, enhance mental faculties, and improves the resistance of the body against diseases. You can prepare its paste at home and then apply it on swollen and painful parts. Paste can also be applied on the wounds and eyelids.